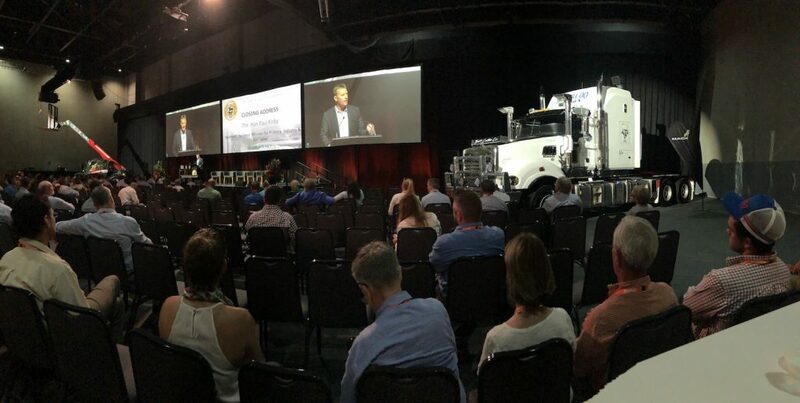 The NTCA conference is one of the few where speakers and delegates share the floor with a Mack Prime Mover. 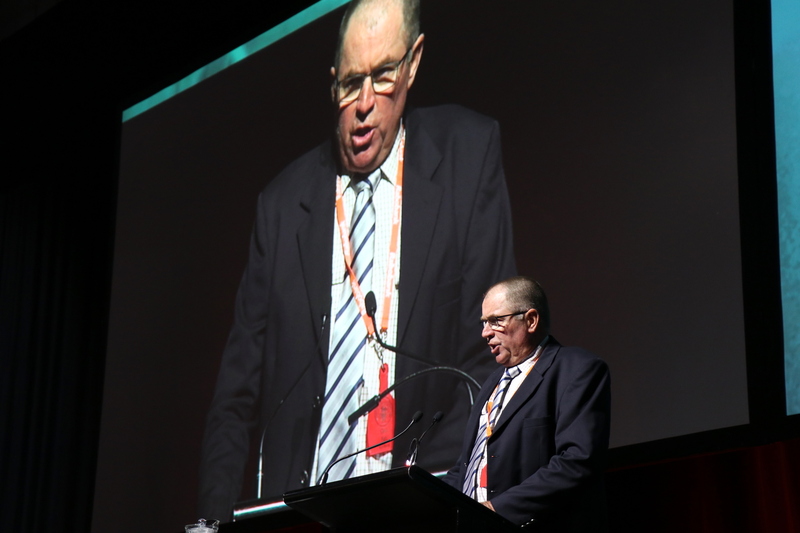 Pictured is NT primary industries minister Paul Kirby giving the closing conference address on Friday afternoon. 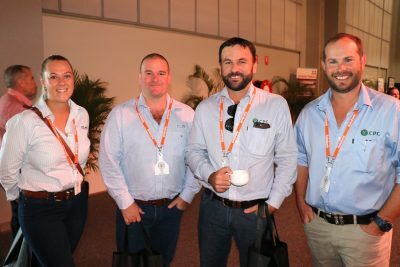 AS anti-meat activists find they can trespass onto private property and harass family farmers with virtual legal impunity, the question of what the livestock sector can do to protect itself in response dominated discussions at the Northern Territory Cattleman’s Association conference in Darwin on Friday. Nearly every speech touched on the issue in way or another. When distilled down, messages from presenters fell under two linked, but slightly contrasting, themes. Several speakers warned the industry must do more to counter misinformation from vegan campaigners. Others suggested the issue is perhaps not as bad as the industry thinks: farmers still enjoy high levels of public trust; people in the red meat sector tend to focus more on what vegans say about their industry than the average consumer does; and those vocally rallying against animal agriculture still boil down to a tiny minority of the community. However, as National Farmers Federation president Fiona Simson pointed out, complacency is a luxury the industry can ill-afford – after all, no one knows better than northern cattle producers what can happen when a minority movement whips up enough social media support to convince a Government to make sudden, knee-jerk decisions. “Whilst they are a small minority they are making a lot of noise, and when they make a lot of noise then we see the moderate section of the community start to listen to what they say, and not question what they’re hearing,” Ms Simson said. “And the worst thing then is that the politicians tend to actually believe them and start making laws to go with this very small percentage of the population. NTCA president Chris Nott said NTCA members have uniformly supported a resolution to increase the $5/head compulsory cattle transaction levy to $5.50/ head, and to use the additional proceeds to empower national industry leadership and to fund advertising and advertorial campaigns through Meat & Livestock Australia to “sell the message of what we do and how well we do it”. In a later panel session NT and NQ cattle producer Dan Lynch proposed going even further and lifting the levy to $8/head, noting the current levy had not lifted for many years and a raise was justified and needed to support an now industry producing in excess of $10 billion worth of production a year. Deputy Prime Minister Michael McCormack said the rise of militant activists and their use of underhanded tactics and ‘activities that have nothing to do with the best interests of animals’ represented a clear and present danger for the industry. “This activism must be resisted”, he said. Mr McCormack wants the controversial Aussie Farms website, which implies that all Australian farms treat animals cruelly and encourages trespass and vigilantism, stripped of its charitable status, but the Federal Government says it has little direct power to increase fines or penalties for trespassers, as they are covered by State laws. Vegan activists are deft at using social media and public protests to create an impression of mass and growing support for their agenda. 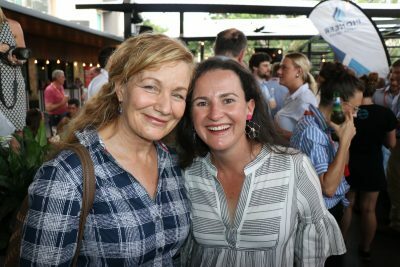 But in encouraging findings for the livestock industry, the just-released results of an independent randomised survey of 3000 Australians indicate that rather than being ‘out to get farmers’, the vast majority of Australians continue to have high levels of trust in the job that farmers do. 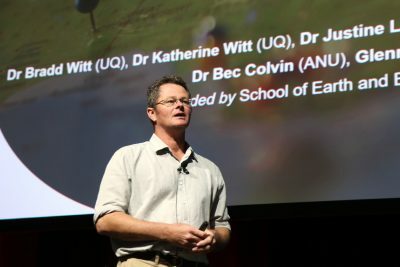 However, the University of Queensland’s Dr Bradd Witt also warned that while groups such as those behind the Aussie Farms website were likely to reflect less than 0.5 percent of the population, a larger proportion of the wider public would resonate with some of their values and their concern. “So it is really important that you understand what those concerns are so you can talk to them before that other group talks to them, because they will align with the identity that they feel most comfortable with,” Dr Witt told the conference. 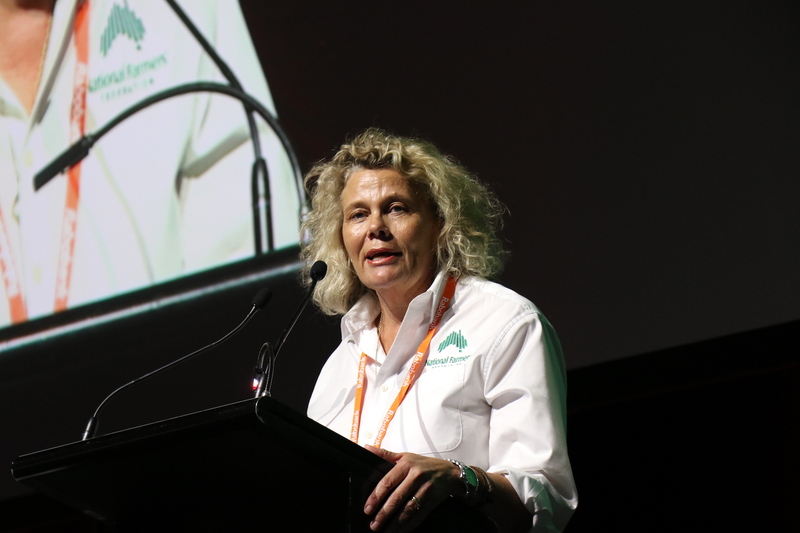 NFF president Fiona Simson said farmers are still held in high esteem by the community, reflected by how many dollars had been poured into drought assistance funds by urban people. However, campaigns from groups such as Aussie Farms and the 100 extremists who illegally entered a feedlot near Millmerran in late March to undermine that trust were only set to escalate, particularly when activists face insignificant penalties for their actions. The activists who recently stole NLIS tagged goats from a Gippsland café, describing their actions as an ‘animal rescue’, received a court-imposed fine of just $1. 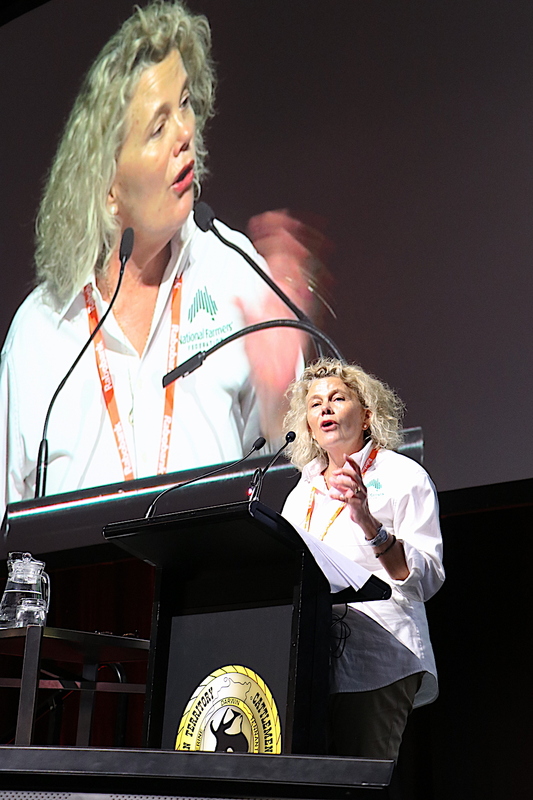 “You know what sort of fine you will get (as a livestock producer) if you’re caught not changing over your NLIS tags, or for an NLIS offence, sometimes it is thousands of dollars,” Ms Simpson said. She said the NFF has written to Ministers in every government, polices forces in every state, the privacy commission and many others asking for State trespass laws to be tightened and privacy laws to be amended. It has also written to Google and Facebook asking them to take responsibility for publishing material from animal activists and the consequences of their actions and to take such content down. A petition launched by NFF urging Governments at all levels to take urgent action to prevent farm trespass has received almost 9000 signatures since being launched mid-last week. Ultimately, the best way for agriculture to defend itself was to ensure it is upholding community expectations. “Whilst we’re doing all these things to try to stop the activists and to do anything legal that we possibly can, we also have to be aware that we absolutely have to make sure that we align with community’s expectations of us,” she said. She also urged all sectors of agriculture to support and stand up for each other. 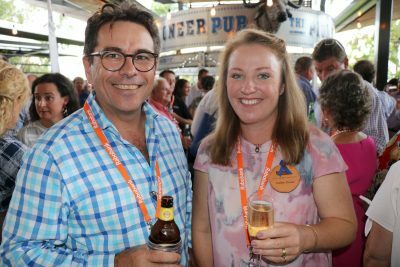 “There is a tendency in our industry to deal only with what is in our own back yard and to keep our heads down when we’re not in the firing line. 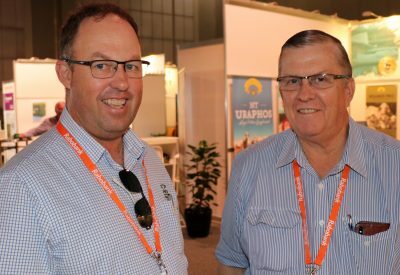 “So cattle producers tend to look the other way when pork producers are under fire about sow stalls, and wool growers are pleased mulesing is not in the headlines when we’re talking about cotton producers and the Murray Darling basin. 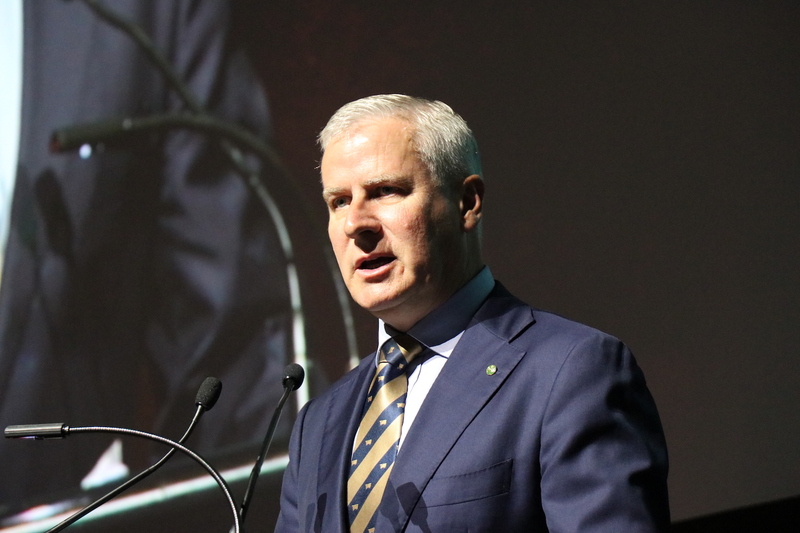 “Maybe it is human nature but we have to change that and that is what the NFF is about. 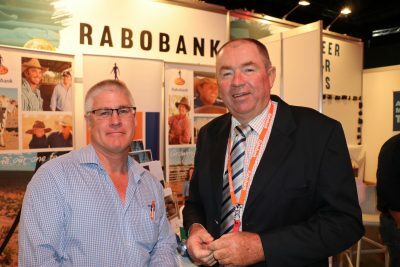 “It is about Australian agriculture, we come fearlessly to the table representing the whole of Australian agriculture, and that is why we think it is our job to start the campaign off, to start talking about trust, to start putting deposits back in that trust bank, to start telling our story and to do it in a way that is going to be sustainable. “Everybody is under fire here at the moment but we badly need to start talking back to the community, to be building our story. “Chris (Nott) mentioned it might be bill boards, it might be signs on buses, signs on airports as you come down, it will be that and much, much more, it will be education around building on the success of programs like the Primary Industries Education Foundation which is already preparing resources for teachers in schools to teach them about where their food and fibre comes from. “It will be about television programs showing people behind the farm gate. “…When we’re talking to people in the city who have got no concept, it may be two to three generations since they have had anything to do with farmers if at all, then it is quite a herculean task to start talking again about farming and building that trust and matching our values with their values. Alister Trier, NT Department of Primary Industries and Resources and Hugh Nivison, Australian Farmers Fighting Fund. Rabobank’s Barry Gerschwitz and NTCA president Chris Nott. 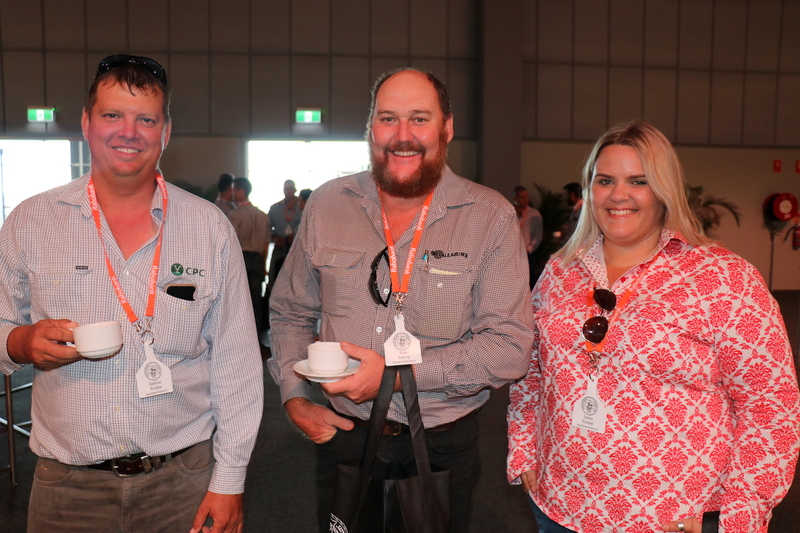 Cameron (left) and Tammy Kruckow, Manbulloo, Katherine, and Brian Rowling, Gallagher, FNQ and NT. 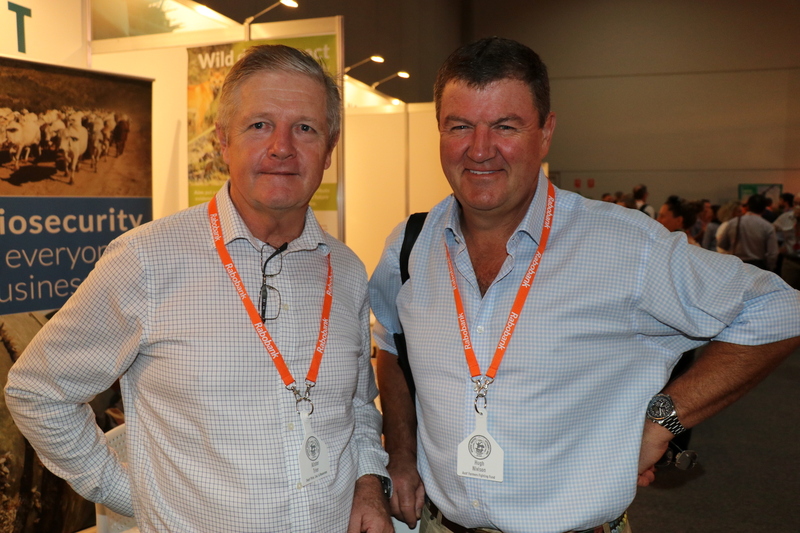 Daniel Wyatt from Pioneer Water Tanks and David Smith from Ceres Tags. Sam Washusen, NT DENR and Abbro Woolnough and Frances Cooper, Mt Riddock Station, Alice Springs. Desiree Jackson, Desiree Jackson Livestock Management, Longreach,Qld, and Ruth Milne, Inverway Station, NT. 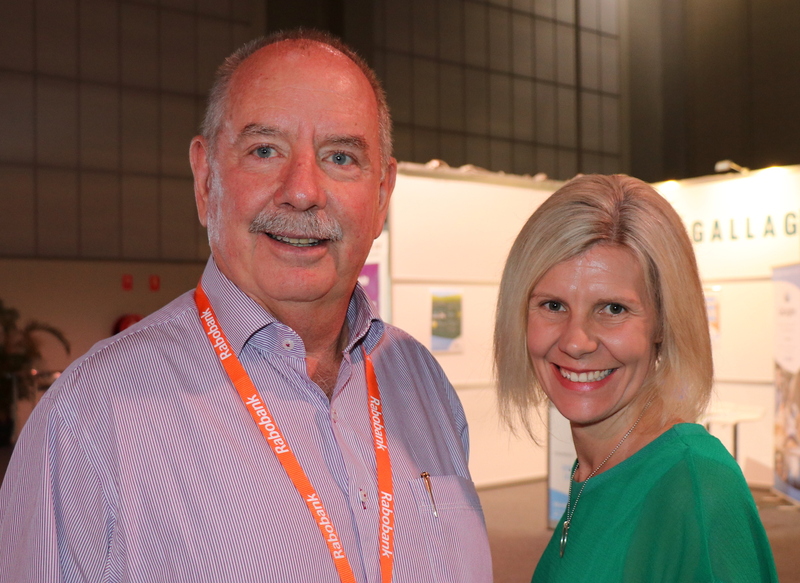 Red Meat Advisory Council independent chair Don Mackay and Meat & Livestock Australia’s chief marketing and communications officer Lisa Sharp. 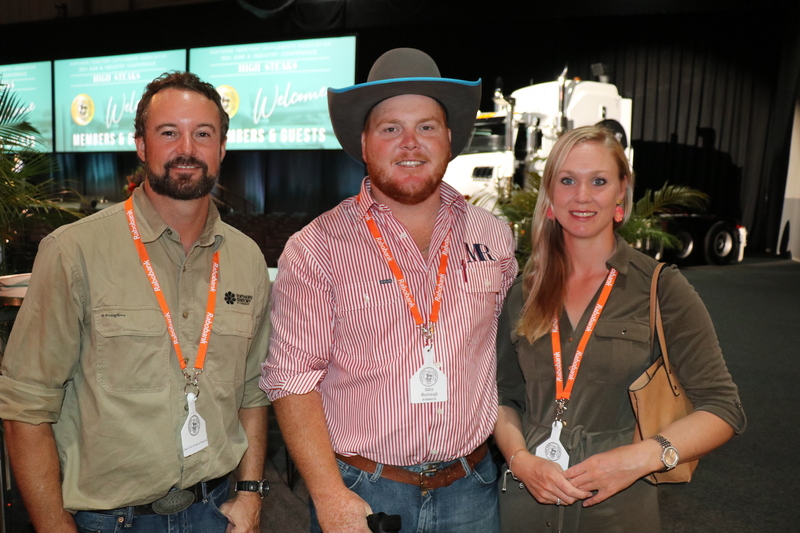 The large contingent from Heytesbury Pastoral Company at the 2019 NTCA conference included (from left to right) Paul Watts, Moolooloo Station; Tinkey Townsend, Flora Valley; Keith Murray; Kate Watts, Moolooloo Station; John Mudford, Pigeon Hole Station; Elaine Joyce; Julie Richter, Victoria River Downs; Dusin Hutley, Mt Sanford; Lauren Mudford, Pigeon Hole Station and Kayle Hutley, Mt Sanford. Former NTCA CEO Luke Bowen, now with the NT Government, and Amber Driver, Elkedra Station, Alice Springs, at the Pioner Water Tanks welcoming drinks. 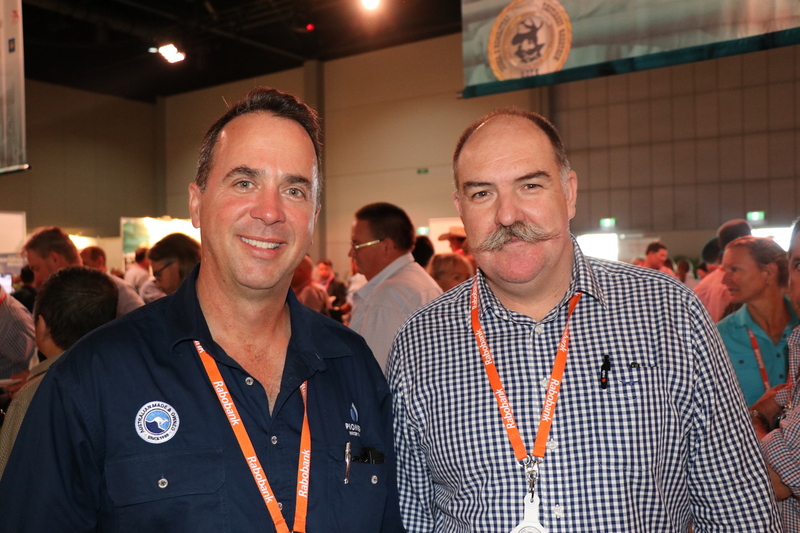 Ridley’s Steve Osmond , Toowoomba, caught up with Northern Rural Group’s George Watkins, Townsville, at the 2019 NTCA conference. Laura Tansell and Dallas Cody from Allflex with CPC’s Carl Greaves and Steve Pocock, Newcastle Waters. Philip Christensen makes some very good points, that said, I am not sure that the outcome for the coal industry is all that positive at the moment. The beef industry is the next in line, we are aware of that, but it is going to be hard to get the objectivity Philip mentions when we have the UN calling for a red meat tax. I made a complaint to the ABC Audience & Consumer Affairs division in response to the Catalyst program that was aired last year. I took the time to look at the so-called scientific research that was used to base the numbers on, to say the methodology was flawed is an understatement. Yet in the response I received from the ABC Audience & Consumer Affairs, it was these UN reports that were used to defend the claims made in the Catalyst program. 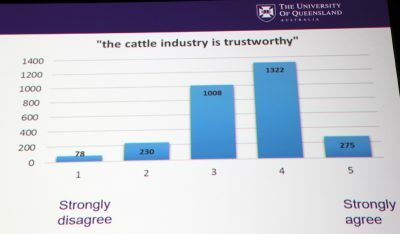 The Australian beef industry has a sustainability report, it is my understanding we have an emissions amount attributed to the production of 1kg of beef, I would also question the methodology that came up with this figure, because it is also my understanding that this amount is significantly higher than the coal industry is quoting in regards to emissions from I tonne of coal. Whilst I agree with the sentiments mentioned in the article, the thought that we need to counter misinformation is nothing new. But it is not only the animal activists that we have to counter, I like many who have raised these issues in industry forums in the past only to be told that the social media analysis indicates that there is little traction being gained and if we were to respond it might only give further traction to the misinformation. I have yet to read the climate policy announced by the Labor party yesterday, but the reference to tree clearing in the news headlines doesn’t fill me with a great deal of enthusiasm. As we go forward we have to stop accepting flawed methodology that leads to questionable reporting in regards to the impact of our industry on the environment. We need to ensure that counter arguments supporting red meat productions place in a sustainable future are well resourced and well communicated. These opinions are my personal opinion. Why is it that this group of people are allowed to get away with trespass and harassment? If it were a group of Bikies it would be a different story!!!! An industry profit from the life long suffering and slaughtering of innocent beings should have no future. Open the slaughter house and industrial farmhouse doors to public so they know how their food is produced. Industry need to seriously think from transforming itself from animal centric to plant centric. It would be better for the environment, our health and animals. NFF should support an end to Animal Holocaust, rather than continue to mislead public by Humane Meat, Free Range Eggs, Happy Cow which are Myth. Chris Nott is correct. Michael McCormack is correct. Bradd Witt is talking academic claptrap. Fiona Simpson is right on the money. These ratbags who think they are justified in trespassing on private land to photograph and abuse have to be made to understand that such behaviour is not acceptable. Just as the ratbags are entitled to hold an opinion, so too are others entitled to hold an opposite opinion, and the forcing of ones opinion upon another is the denial of freedom of thought. I have observed this activity from the coal sector perspective and comment from that lens. Unfortunately many activists become so passionate that their objectivity is compromised.Rational speech and actions are lost. They will view a law such as trespass as a price to pay for their “cause”. Perhaps even a badge of honour. Speech becomes shrill and objectivity is lost. The amygdala becomes engaged.The audience is the people already converted to the cause. The aim is not rational discourse. Equally, farmers must not get suckered into equivalent shrill speech and tactics. The solution , if possible, is to ensure ( as best one can) that the community ( whatever you consider that concept to be) is on board with your views and the industry. If there is room for improvement then acknowledge it. If facts need to be repeated, repeat them. Consider a Sustainability Report for the industry. Both sides yelling at each other wins no long term support for either. Do not underestimate the activists funding. Many activists may appear unkempt but there may be a well funded campaign starting. It will not go away. Many activists wear suits and reside in the cities. They will speak to bankers, investors, retailers and consumers. Be wary of school teachers and their teachings to the children. Education at all levels is critical. The coal industry did not appreciate this at first and lost the hearts and minds of many in the community. The politics becomes the politics of a green marginal electorate -usually a long way from a cattle property. Your local member’s vote in Parliament will not be shifted. It is usually solid. It is in a swing ( city) seat that the issues become hot. A politician can agree to harmful laws if a vote is in it. I would suggest get well organised and be vigilant…keep on the front foot and do not become reactive. Finally, do not underestimate the threat. These activists have to be stopped NOW. If we let them continue to disrupt good hard working farmers and staff on properties, they will get momentum. When this happens, it is bloody hard to get the general public to listen to the farmer’s side of the argument. These bludgers, may be a noisy wheel but they are being heard, even if it is a distorted view that they are projecting forward. The Government, whether State or Federal must step in and put a halt to this left wing bs.